I will freely admit, it was almost impossible for me to sit down on the computer just now. The past few days have been filled with all sorts of goodness, primarily, in the four-legged, furry form. And actually, for once, I’m not talking about cows. Or sheep. Man, there’s a lot of four-legged, furry things runnin’ around these parts. …rather, I am talking about our new puppies. Yes, I said it. Puppies. I know!!!! Puppies make me happier than Georgia in a pink-tutu themed chocolate store. “Loch” and “Luna” are (for a short time anyway) the newest additions to our farm. The pups are an LDG cross – primarily Great Pyrenees. But in all seriousness, ahem, acquiring these puppies was not something we did lightly. Unlike many other dog-owning homes, we can’t just ‘decide’ to get a dog and have it be. When one lives on a farm, one must take many factors into account. Like children. And boundaries. And free range chickens. And stuff. 1. How much land do you have? Livestock guardian dogs are notoriously large dogs. They are bred for one purpose and one purpose only: guarding livestock. Because of this, they’re constantly on the prowl for invaders. They need room to roam, baby. I’ve read conflicting reports as to how much land is ‘enough’ land, but I would guesstimate the minimum should be around an acre. We sit on a 10 acres. 2. Will the dog have livestock to guard? When we purchased our dogs from the breeder, one of the first questions that we were asked is if we had livestock. These dogs are not happy without a job and without a purpose. Guarding livestock is their purpose. Without livestock to guard, well, their life is pretty much purposeless (at least in their minds). Our dogs will be in charge of guarding the cow (and her calf), the herd of sheep, the pigs, and the chickens. 3. Have room for one more? It’s been noted (by most everyone who has had livestock guardian dogs before) that they tend to perform much better in a pack. The dogs will often trade off ‘watch’ – while one rests another will stand guard until they switch. One dog will chase off invaders while the other will stand guard of the flock. They work better as a team – at least two (or more!). Even though we only intended to get one dog for the farm, we inevitably ended up with two new puppies for this reason. They can learn, grow, play, and protect together as a team. 4. Do you have the time to invest? It can take anywhere from 18 months – 2 1/2 years for livestock guardian dogs to reach maturity. During this time, you’re required to invest a lot of your time into them. Much like a healthy marriage, a good livestock guardian dog is not an overnight success. It takes hours and hours, weeks and weeks of patience, correction, and instruction. It was for this reason that we thought now would be the good time to get our own pups. 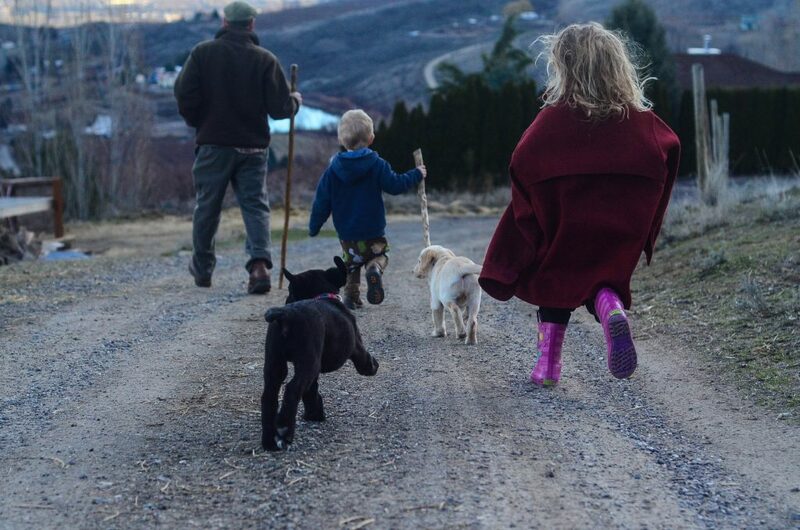 Even though we have three young kids and life can be a bit cray-cray around these parts, we knew that in two years, we’d really need mature dogs around (we dream of expanding our sheep herd even more…). I wasn’t interested in starting to train a dog when I had a field full of valuable ewes and their lambs. I need a trained dog before all those animals (and all of their profits!) are put at risk. In the next few months alone, we’ll be welcoming two new ewe lambs, new lambs from Rosie, three new heritage (and extremely valuable) piglets, and a new calf from Sal. 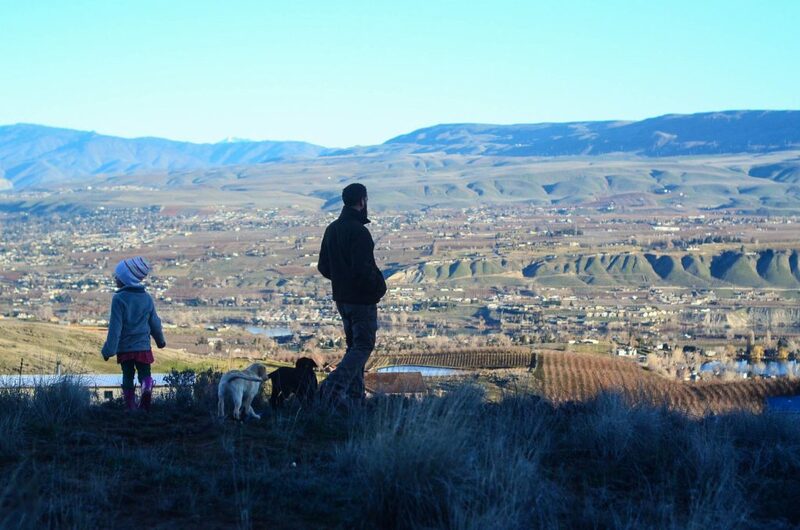 Each of those animals represents the future of our farm and an incredible value to our family. Cougars and coyotes pose a serious risk around these parts. I’m not interested in my animals becoming supper (at least for the predators, anyway). All that to say, it was essential we start training pups as early as possible. 5. Do you have access to a good breeder? I’m not so interested in any one specific breed of LGD. These are many noted breeds that do a great job. When we started looking for local breeders, we found a few… but most of them just bred the dogs for the sake of selling the puppies. We needed to find a breeder that bred and raised the dogs for work! That is, after all, what these dogs are for. 1. Did the pups have high quality nutrition? Did their mother? Just like with humans, a whole-foods based diet is great for dogs. And, as we all know, nutrition is the building blocks of life! 2. Are the parents around? Are they able to teach the pups basic skills? This is a great way to also see temperament/interactions/etc. Good parents will show their pups lots of skills from the very beginning. Our pups had parents and grandparents right on site. Such a fantastic learning tool. 3. Are the dogs well socialized? To animals? Kids? Noise? 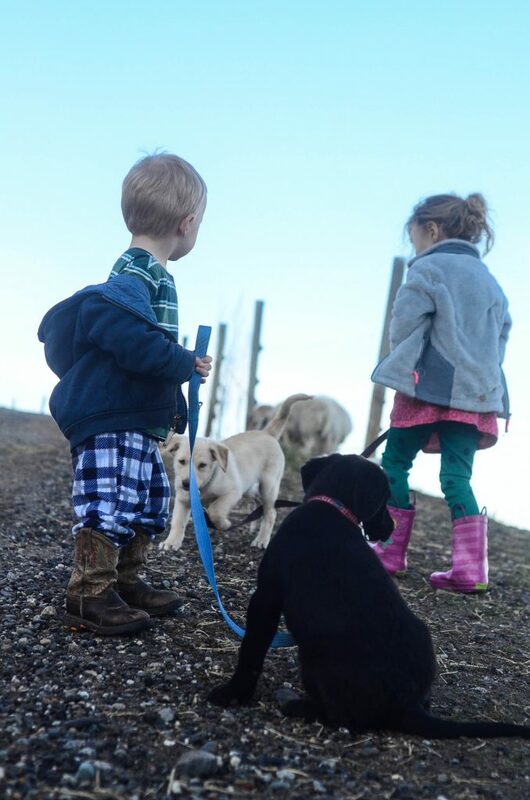 Farm life is a busy life and it’s essential the dogs are acclimated to what that looks like – the earlier in their life the better! 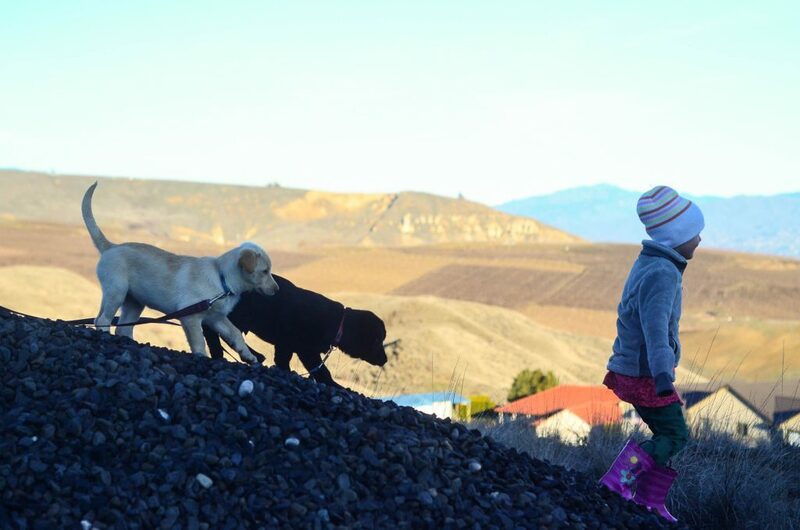 Our dogs were chosen specifically for their personality and their temperament with children. We were blessed enough to find a local breeder, named Huckleberry, who helped, educated, and guided us along our first LGD purchase. He helped pair us with the best pups for our situation and drove out of his way to meet us and make it all possible. Aww. It makes me want to love anyone named Huckleberry. For starters, it’s a great name. And for two, it will now always be associated in my mind with puppies. What could be better. The puppies were brought back to the farm, where they promptly met the livestock and took up lounging and romping around their new dog house (donated by a friend of ours who no longer needed it). Each morning, they are taken around the perimeter of the property by our entire crew: Stu, with his walking stick and flat hat. Georgia, with her tutu and Daddy’s coat she insisted on wearing. Owen, with his own miniature walking stick and snotty nose. Mama Shaye, with her un-makeuped face and incredible fashion sense. Toby, the border collie, with his wisdom and never ending energy. And now, Loch and Luna. The morning walks are a time to teach them their boundary that they are in charge of protecting. We’re still teaching them their names and some basic commands. We also continue to facilitate interaction (monitored interaction) between them and the livestock. The sheep don’t pay too much mind yet (the pups are small and unthreatening). Sally licks and smells, just like a Mama (secretly, I think she’s just getting desperate to get that calf out of her belly so she can be a free Mama again!). Also, just a quick note: the puppies are almost impossible to photograph. For starters, they never sit still. And for second, one is white and one is black. It’s a manual-exposure-setting nightmare. Though the pups are still settling in, and though there was a lot to consider in bringing them to the farm, it’s nice to be settling into a routine with them and be on the path of companionship and guardianship. Man, these pups are smart. We need more of those smart animals around here. It makes up for the all the chickens. And Amen. DISCLOSURE: In order for me to support my blogging activities, I may receive monetary compensation or other types of remuneration for my endorsement, recommendation, testimonial and/or link to any products or services from this blog. I appreciate the support and love y'all have shown this 'ol blog and will only recommend products that I use, love, or covet. The end. I’ve put together a fresh printable of a few of my favorite new fall recipes for you to enjoy in your own kitchen. They’re easily adaptable based on your family’s needs and your garden’s offerings. Looking forward to reading more on this adventure – this is definitely something we want to pursue. Just out of curiosity – is the whole 10 acres fenced in? Are you showing them that boundary? Or just the boundary that’s fenced/you want them to protect? We have about 13 acres total, and 90% unfenced (no large animals yet). Thanks for this post! And impeccable timing at that. We just moved to a small dairy farm that my husband is working on (only renting for now. It is a 70 acre plot with even more surrounding arces of other farms). We have a 2 year old mutt who is our family dog thats really good for nothing except barking 😉 We aren’t allowed pets inside so we designated the summer kitchen house for our Louie and two cats. Well last week I notcied coyotes about a field over and last night notcied them awfully close to the barns and summer kitchen. I talked to my hubby about getting two great pyrenees dogs. My question is how is your border collie taking to the new pups? Is your previous dog male or female? Do they all stay together outside? We’ve got the guns ready to take out some coyotes but I’d really like something else out there for 24/7 protection. I myself live on a small hobby farm with 6 acres. We have horses, chickens, geese, barn cats and a couple small house dogs…but a donkey is next on my list, I’ve read that they are great for keeping coyote away! I have looked into guardian dogs and will defiantly be gettin a couple of them also. We don’t have wild cats in southern Minnesota, but coyote are all over the place, along with Eagles. Good luck with your New farm!! If I we’re you, I would get a solar electric set up low enough to protect your animals, they even have it as fencing, in not that expensive, and so worth the expense to keep your animals safe. I have friends in Northern Wisconsin with a hobby farm, and she swears by donkeys to keep the predators away. Currently they have two donkeys and no problems with wolves or coyotes. Apparently the noise alone is enough to deter them. They still have some skunk and weasel issues in the henhouse now and then, but the threat to the goats, pigs, and poultry from larger predators is almost gone. I don’t know anyone with livestock guardian dogs — these friends just have a pair of English Springer Spaniels as companions. This is awesome. We are looking forward to getting a LGD this year, and this is super great info for me. Thank you! I am always thrilled to see farms such as your implementing long proven, down home strategies to live off the land and raise children in such an environment. For that, I applaud you and I always enjoy reading your posts on the various topics about which you so eloquently write. However, on this topic, I must say, you are sadly misinformed. You’ve got the qualities of a good LGDS nailed down, but you have the wrong dogs. The pups in the photos are clearly lab mixes and no responsible LGD breeder out there would sell such mixed breeds as livestock guardian dogs. There is a huge difference in the mentality of a true LGD and that of any other dog. They have been bred and raised for centuries to do what you describe in this article. Unfortunately, someone claiming to be a reputable breeder has sold you dogs that will likely never be what you intend them to be. There are certain breeds of LGDs and when crossed with Non-LGD dogs, often prove to have just as much of the undesirable instincts to chase/kill/harass your livestock as desire to protect them. (talk about a confused dog!). Since they are often given the assignment of protection, with easy access to the animals they are meant to protect, they have ample opportunity to wreak havoc on a farm. Horror stories abound. I have bred Anatolian Shepherds for years and own Great Pyrenees also in a working situation. True, reputable breeders of actual LGD breeds will all agree that information like the article above only serve to confuse people who don’t do their research about true LGDs and make them think that just any dog can be a livestock guardian. ANY dog cannot be a LGD! I do hope you will keep us posted on their progress, but do not make the mistake of believing these dogs are going to be LGDs. They may turn out to be wonderful farm dogs, and yes, I have had labs for years and love them, too. (In fact one is sleeping at my feet.) Their personalities though are very different and you just can’t train in that instinct to guard. They are hard wired for their specific job just like LGDs are instinctive in theirs. I wish you the best with these pups, and I hope they can be a wonderful addition to your farm and do no harm. But please be careful. You have a long road ahead as they mature and enter the dreaded “big puppy” stage when their ornery behavior will be over the top. They absolutely CANNOT be left alone with livestock! I am positive when they gang up and kill their first chicken, or lamb or whatever, it will not make a very nice story for your blog. Good luck and please heed the warning that I have given and know it will be echoed by other breeders of LGDs. Shelley, I appreciate your advice, but the pups do not have any lab in them. Thanks! What breed(s) is mixed with the Great Pyrenees in your pups? They certainly do look a lot like labs. We own chickens and horses and have a Great Pyrenees, as a pet, not to guard the livestock specifically. The instinct to guard definitely runs deep. She barks at just about anything that moves and is hyper-vigilant about protecting the property and her (flock) consisting of my husband and myself, our 4 other dogs, 3 cats, 12 chickens and 2 horses. They are great dogs but being a giant and working breed, unless they have a “job” to do can get into a lot of mischief as they mature. It took ours till about age 3 to get out of that stage. She’s now almost 3 1/2 and still can find things to get into if we don’t keep things “puppy-proofed”, not easy with such a large dog, she can reach just about anything she sets her mind to getting. Good Luck! Can you please tell me if I can put a 10 week old fUll blood GP pup out with my other 5 yr old GP LGD? We had 2 5 yr old males & 1 I came up missing & we found a 10 wk old female pup, but I didn’t know if I could just put her out with our 5 yr old GP that has been on our property since he was a pup! I don’t even want her in at night do I? I don’t want her to be in our home, I want her to be out & do her job? Cute dogs, it starts with one and jumps to three mine did that as well my hubby keeps bringing them home, your kids must be in puppy heaven. Those don’t look anything like great pyr though, what are they mixed with? One of my tenants has a arctic/timber wolf that is best friends with my Great Pyranees he is teaching him horrible kill small animal habits that need to be broken immediately. How lovely! I’m a little envious but it’s a huge commitment. One I feel i don’t have time for at this stage. I will enjoy watching your puppies grow! So cute! We live on a quarter section of mostly bush and have felt that a good guard dog to be one of the most essential animals on our property. We’ve heard of some other locals near us that have given up on livestock due to predators. In our year and a half here we’ve only lost one hen to a predator. We started with one dog but now have two and they both work hard all night to keep our little farm safe. Sometimes the training and teaching have been very frustrating, but I don’t think we could have animals (or let our children far from the house!) without them. Good luck to your training! Great tips here, Shaye! Our next round of dogs will LGDs (we have two house dogs now, throw backs to our city homes) and these tips are helpful to consider! And the cuteness?! Yeah…that’s a thing, isn’t it 😉 Have fun with those sweeties! Ahhhh!!!!! Puppies!!!! Those faces just melt the heart, I tell ya! Congrats for your new additions and we can’t wait to see and read how the training goes. Do they currently sleep outside with the livestock, or will that come down the road? Congrats again! Oh puppies are cute cute cute…… But so much work. I’m glad it’s you and not me. Wink! You have more patience than me! We got a 6yo Great P from someone leaving the farm life….he is wonderful! We had a Plott Hound puppy, who ran away after a few months, and a Blue Healer who killed a duck and went back to previous owner in less than a week. We plan to get a GP pup and hopefully it will learn from the 6yo. Nice! We are picking up a Great Pyrenees from a line of working dogs near is in GA on Tuesday… The cows, sheep, goats, etc. have donkeys for protection but the chickens had nothing for the predators (ground or aerial) so LGDs here we go… Should be great! Thanks for the fun updates! We have had a Great Pyr on our farm foe so many years. Think we are on our 4th one. We also have a llama, neutered, that stays with our flock of sheep 24/7. Between the two, I think we have a best case scenario. I have seen a great Pyr actually nursing a baby lamb and one of our would stay with a newborn in the field if the ewe walked off. Have one now that mo one gets in the barn unless they speak her name. Would NEVER be without a LGD!!!! Hi Shaye love your blog we live on an acreage and have part time free ranging chickens and a 10 month old austailian shepard similar to a border collie in temperment and energy level. Recently she has mauled two chicken not killing them. Did you ever have this problem? I also feel like shes a dog who needs a job but at the moment we don’t have any other livestock so struggle to find her a job other than herding the chickens to death. Our dog is the same way though he has learned not to ‘play’ with the animals. Often looks like he wants to eat them which scares visitors. I might put a rabbit in a small pen or something like that which could occupy him but set boundaries as well. Honestly, it will probably take some training for him to act round the livestock the way you want him to. Thank you so much for taking the time to share your Puppy experience and training. Your blog is a pleasure to read, and the pictures are adorable. Best of luck to you. We have two pups who were not so lovingly chosen. They showed up at our place one day, having been dumped in the woods near our home at about 8 weeks of age. Cute as all get out and our kids immediately loved the puppies. They are large black labs, and while they happily keep the deer out of our yard, they have thus far killed every one of our chickens they can get their paws on, after a full year of carefully working with them around the birds as they grew. They’ve also killed squirrels, possums, rabbits, and anything else they find. We’ve been working with a trainer, but we’re so disappointed with our dogs’ drive to kill everything they find. If you have any advice about how to work with a 1.5 year old pair of large dogs to retrain them not to kill chickens, I’d love if you could post about it! I know a lot of people don’t like the idea, but with my dogs I have always used training collars. Basically it’s an electric collar with two options on the remote control, buzz/beep and shock. You do a beep followed quickly by a shock the first couple of times, and after that a smart and/or submissive dog will never need the shock again. It’s worked wonders for our headstrong terrier and made training our Irishdoodle much less stressful. It’s possible that could work with your labs? We had a maremma x great pyrenees mountain dog a few years ago. It wAs to protect US. Unfortunately we had to get rid of her as she barked ALL NIGHT long. We were getting constant abusive phone calls from the neighbours in the wee small hours of the night. We’d find her barking at birds and frogs. Nothing serious. So we moved her along to a friend haha and got a german shepherd for our personal protection. She wasn’t the easiest dog to catch and wasn’t cuddly at all so it didn’t worry me too much. Any good dog will alert you to things being ‘wrong’ about the place. My Cairn terriers and labradors have been the best watchdogs of all. The german shepherds are beautiful with my family and absolutely give the impression to go away to intruders. However, I’ll be going back to labradors soon. We only have issues with foxes and the i cassional wild cat or dog- or neighbour’s dog on the loose. I find labs so fabulous and quite protective as well. The best tip I can give is to have the pups live night and day with the stock they are to guard. Sure you have to vet them and care for them, but they’re not pets at all, they have a serious job and anyone who has had succes with them here in Aus raise them as part of the flock. Be that sheep or chooks. Not too much human interaction at all. I hope they work out to be evrything you need. I had to giggle a little at your comment about the Cairn terriers… mine is about the worst watch/guard dog I’ve ever met. We have a Pyr/Anatolian mix. I wish I had researched more before our purchase. Shaye did well getting two. I found out after the fact that I should have purchased 2 and from a working stock. We purchased one from a family who raises them for pets. If you are interested in purchasing the Pyrenees, research, research, research and make sure you take in ALL the information and consider carefully your purchase. The other thing I didn’t realize was they bark! Did I mention they BARK? All night? Sometimes I wonder how she has a voice in the morning. My poor hubby is ready to pull his hair out. We purchased her because we have 12 Nubians with coyotes and neighboring dogs. 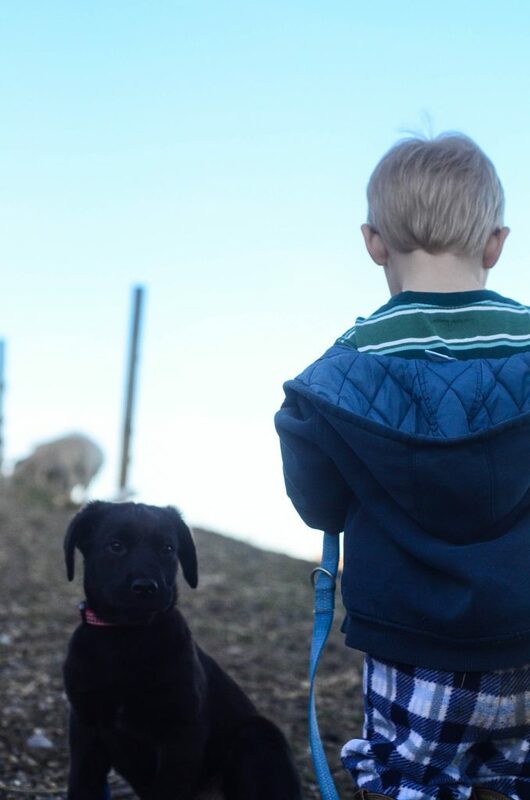 Well, again my inexperience has possibly resulted in the fact she wont be guarding the goats, but us. She should have been kept with the goats from the beginning, but she was so very cute, we kept her inside at night. At this point, to get any sleep, IF we can “convince” her to come inside, she’s in so she’ll just BE QUIET. We’re also worried about our neighbors….keep their proximity to your property in mind. They might be a little upset to be kept awake all night by the dog who barks at the leaves rustling in the wind, or a mouse scampering across the lawn. We love our dog, but they are NOT easily trained and very LOUD. She is super sweet with an undisciplined 2 year old mentality. For example, if she sets her mind to something, you can call her all day long and she’s going to pursue her instincts over your command. I guess, in summary, carefully consider what you are getting into. It’s unfair to your pup to decide after the fact you can’t handle the barking or their independent, strong-willed nature. If properly trained and from a good working stock, I am sure they will be awesome dogs. GOOD LUCK! Our Pyr is from working parents, supposedly Pyr/Anatolian mix, our girl looks like pure Pyr as does her sister who a friend owns. We also didn’t research till AFTER we got her. Yes, they do bark, loudly, and frequently. She barked more at night as a young pup. It’s less common now (she’s 3 1/2) unless they go out to use the bathroom at night. She sleeps with us in our bedroom with our 4 other dogs and occasionally one to three of our cats. During the day it’s a different story, she barks at passing cars, neighbors, deer, etc. I’ve seen her wake up from a sound sleep because a deer was on our property. I agree they aren’t easy to train. Very independent, which makes sense due to what they are bred to do. Ours often won’t come when called unless she wants to and still often has the mentality of an undisciplined 2 year old as you mentioned. She knows well and good when she’s being naughty but it’s like she just can’t help herself. If she’s busy interested in something it’s almost like she’s deaf. She minds me better than she does my husband and she’s as tall as me when standing on her hind legs and I only outweigh her by about 15 #! But I must say, she is sweet, cuddly, loving, affectionate and gentle with our other pets, not to mention just adorable even as a 100# adult! We live in the country and get foxes, coyotes, mountain lions, deer, skunks, possums, racoons and an occasional bear around here. Our vet said the barking is an asset in this situation, especially with the large cats and the fact that we often have 5 dogs barking. The predators will think it’s a pack of dogs and steer clear. What are they crossed with? These are LGD mutts – primarily Great Pyrenees. Their parents were both working LGD. Congrats on your new pups. I have just read some of the comments posted here and I must agree with many of those who voice their concerns about the cross breed you have. 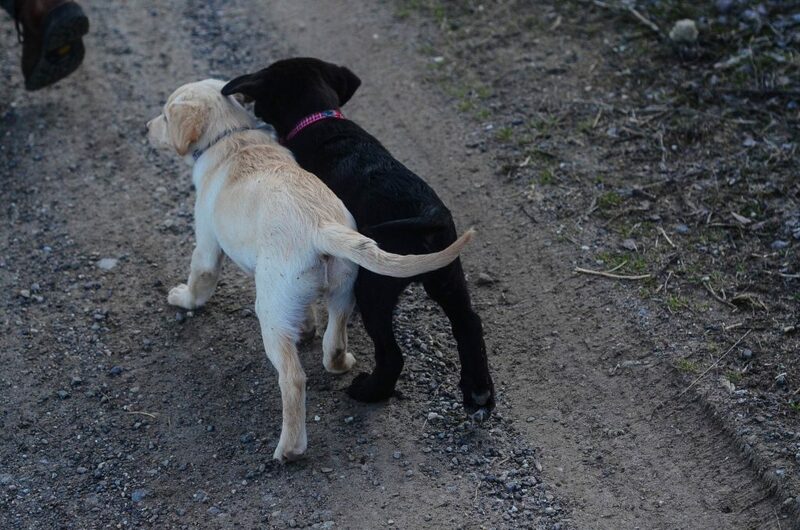 The two pups do not show any traits of GP, and look mostly like lab crosses, particularly when they come in black! I too think that the pups you have acquired are perhaps more something else than LGD, which would be very concerning to me as a livestock owner. Did the breeder not say what the cross was? It sounds to me that the breeder pulled perhaps the proverbial “wool over your eyes” on this one. I am sorry if these comments offend or hurt, but I have to fully agree with Shelley and her observations. Please tell us in what way these pups are bred (other than mostly GP) as I see no GP at all in them. Are they Akbash cross, or Anatolian? We are just starting out with our small farm and are hoping to get chickens and goats in the spring. I’ve been researching LGD like crazy…and the cost of getting one, much less two, are keeping me from making the plunge. Of course, I looked at some of the rescues, but none will adopt to us because we turned a dog in (we lived in the city and the dog turned out to be a herding dog, contrary to “expert” at the rescue…my children were terrified of her after a few weeks of nipping). So now, we have a tarnished name in the world of rescue shelters because these people value the dog over all else. It’s so frustrating. and truly good material in support of readers. I have a question. We may be moving to Mississippi and getting 2 or more acreas. We want to raise a couple steers, goats, and chickens. We will back up to a lot of trees where predators can hid. Is a guardian dog a good choice or should we look into another animal ( lama, donkey, etc)? We have chickens – that coyotes just took out 7 of 9 in one day. 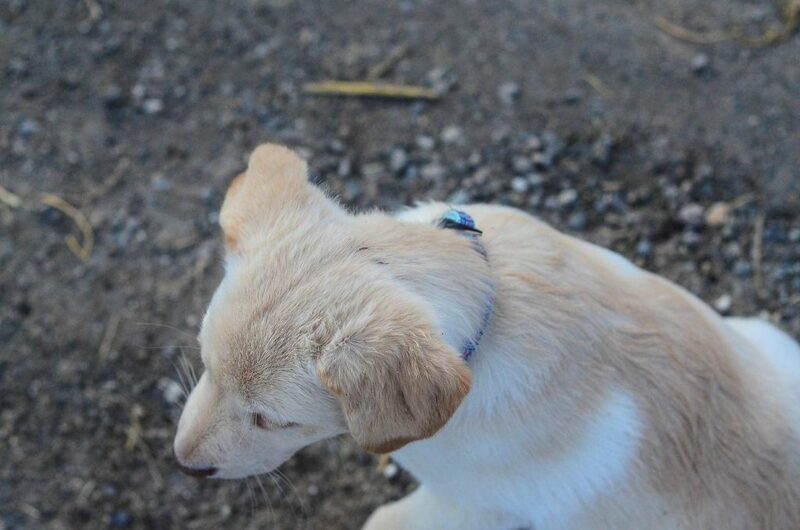 We have just gotten a 4 month old puppy – 1/2 Anatolian and 1/2 Great Pyrenees / Lab mix. In addition we have kennels where we house WORK(drug) dogs. I am wondering if we can train the pup to guard the work dogs in the kennels as well as the chickens? What do you think? I need input and the why behind it please. Recipes, Farming, Gardening, Homeschooling, Oils, & More! Get all of our recipes, farming news, and updates and happenings sent right to your inbox!